This week concerns about Trump’s foreign policy were front and center, as the regime rolled back sanctions against a Russian oligarch, and withdrew from the Cold War-era Intermediate-Range Nuclear Forces Treaty — both seen as victories for Putin. The Financial Times reported on a previously undisclosed one-on-one meeting between Trump and Putin at the G20 just months after Helsinki. Congress rebuked Trump’s foreign policy again this week in a piece of legislation drafted by Majority Leader Mitch McConnell over Trump’s withdrawal of troops from Syria and Afghanistan. Heads of U.S. Intelligence agencies testified before the Senate on their annual “Worldwide Threat Assessment,” revealing findings in sharp contrast from Trump on Iran, ISIS, and North Korea, as well as the southern border. Trump reacted by castigating his appointed agency heads, then later inviting them to the Oval office and blaming the media instead. This week Trump continued to threaten to do whatever it takes to build his wall, including declaring a national emergency if the bipartisan congressional group does not fully fund it. Meanwhile, Trump continued his false narrative that the wall is being built, while spreading other disinformation about immigration and voter fraud. The far-right has increasingly adopted Trump’s strategy of creating alternative realities and embracing conspiracy theories — this week claiming an attack on a gay, black actor was a hoax, and spreading conspiracies about Supreme Court Justice Ruth Bader Ginsburg’s health. The country is increasingly divided, as the U.S. Intelligence assessment also warned that Russia and other countries are looking to sow dissent, spread disinformation, and interfere in future U.S. elections. Watchdog group Transparency International released its Corruption Perceptions Index for 2018. The U.S. dropped four points to 71 over 2017, and dropped out of the top 20 nations for the first time since 2011. On Saturday, NYT reported Trump’s defeat in the border wall standoff with Congress has left him vulnerable to a primary fight, as anti-Trump Republicans are urging fellow Republicans to run. A top Trump campaign official, Bill Stepien, traveled to the Republican National Committee meeting in New Mexico to orchestrate a unanimous resolution of support for Trump, in an effort to project party unity. On Sunday, in an interview with WSJ, Trump said he thinks it is “less than 50-50” that the 17 members of congress charged with negotiating a deal over border wall funding would come up with something he could accept. On Sunday, Trump tweeted, “58,000 non-citizens voted in Texas, with 95,000 non-citizens registered to vote,” citing a list compiled by the Texas secretary of state’s office, and mentioned on a “Fox & Friends” segment. Texas politicians and voters’ advocates asked officials to investigate both figures, suggesting the notion of voter fraud has been conjured in the past as a way to remove voters from the rolls. Trump also tweeted Sunday, “the cost of illegal immigration so far this year is $18,959,495,168. Cost Friday was $603,331,392.” It is unclear where Trump got his numbers from, but experts said they were too high. Trump also tweeted “There are at least 25,772,342 illegal aliens, not the 11,000,000 that have been reported.” Most studies put the number close to 11 million, and Trump’s Department of Homeland Security recently estimated 12 million. On Saturday, Reuters reported after NATO and Russia failed to resolve a dispute over a new Russian missile allies say is a threat to Europe, the U.S. may pull out from the Intermediate-range Nuclear Forces Treaty. On Sunday, at the Screen Actors Guild Awards, actress Patricia Arquette thanked Robert Mueller and “everyone working to make sure that we have sovereignty for the United States of America” while accepting an award. WAPO reported that Trump, who often spends days in the presidential residence, relishes giving tours of the White House to hundreds of acquaintances and strangers, bragging about how he has improved it. Although former President Obama typically does not respond to Trump, an Obama White House official told WAPO there was no hole in the wall, and that Obama rarely worked in the room and did not watch basketball there. On Monday, a Congressional Budget Office report found the 35 day government shutdown cost the U.S. economy about $3 billion in forgone economic activity that will not be recovered, not including indirect effects. The agency’s annual report also out Monday found the federal budget deficit will hit about $900 billion this year, and exceed $1 trillion every year beginning in 2022, two years earlier than the CBO estimated last year. The CBO also estimated the national debt will soar to almost $29 trillion in 10 years — making debt held by the public the largest percentage since 1947, and more than twice the average of the past 50 years. A new Politico/Morning Consult poll found just 31% support shutting the government down again to force Congress to appropriate money for the wall, while 58% oppose it. On Tuesday, Harley-Davidson announced Trump’s tariffs had wiped out its profits in the fourth quarter of 2018. The company’s stock plunged 7.6% on the day, and overall was down by 33% for the year. On Wednesday, NBC News reported Foxconn may not build a $10 billion plant in Wisconsin, citing the high cost of U.S. labor. Trump announced the Foxconn deal with much ballyhoo at a White House ceremony in 2017. On Wednesday, Louis Woo, special assistant to Foxconn Chief Executive Terry Gou, told Reuters the company would instead create a “technology hub” in Wisconsin that would largely consist of research facilities. On Friday, after talks with the White House, Foxconn said it is moving forward with construction of the Wisconsin factory, but would not clarify what kind of jobs will be housed at the $10 billion plant. On Monday, New Jersey state Sen. Dawn Addiego became the latest to leave the Republican Party and become a Democrat. Addiego’s defection gave the Democrats in New Jersey their largest majority in decades. On Monday, an AP-NORC poll found 35% approve of Trump’s handling of foreign policy, 63% disapprove. Also, 53% say U.S. standing in the world will get worse next year, while 21% say get better, and 25% stay the same. The National Oceanic and Atmospheric Administration Twitter account responded, “Winter storms don’t prove that global warming isn’t happening,” with an accompanying illustration to explain. On Monday, Politico reported Senate Rules Committee chair Roy Blunt plans to take up a measure in his committee to cut debate time on some lower-level Trump nominees for the judicial and executive branch. Sen. Blunt said he hopes the measure can be passed in a bipartisan way, but added if it cannot, Republicans are prepared to use the “nuclear option” and act unilaterally and add a permanent reduction. Most Americans favored Congressional Democrats: getting Trump’s tax returns (60%), investigating campaign collusion with Russia (57%), ties to foreign governments (61%), and Trump’s relationship with Putin (59%). On Sunday, the Trump regime lifted sanctions on Oleg Deripaska, one of Russia’s most influential oligarchs. The sanctions were put in place against Deripaska and six other oligarchs in April over 2016 election interference. One Deripaska company, EN+, announced seven new directors as part of the deal, including Christopher Bancroft Burnham, a banker who served on Trump’s State Department transition team. Rep. Jackie Speier wrote to Treasury Secretary Mnuchin raising concerns that he sold a stake in his film company to Len Blavatnik. A spokesperson for Mnuchin tweeted that this was false information. Democrats Rep. Elijah Cummings and Sen. Ron Wyden wrote to Treasury seeking information on Mnuchin’s relationship with Blavatnik, and whether he sought ethics guidance or to minimize conflicts of interest. NBC News reported even as the European Union moved forward last week with sanctions against Russia for poisoning Sergei Skripal in the U.K., three months after deeming Russia in violation, the U.S. has yet to do so. On Saturday, The Daily Beast reported, three weeks into the term, House Republican leadership has yet to name the intelligence committee’s GOP membership, stalling the committee from conducting hearings. On Monday, Rep. Adam Schiff, chair of the House Intelligence Committee, said Michael Cohen will testify before his panel on February 8; however, it will be closed-door testimony. On Monday, WAPO reported Lanny Davis said Cohen has swapped attorneys, wanting new representation as he navigates testifying before congressional panels. This is the third iteration of his legal team. Cohen is bringing on Michael Monico and Barry Spevack, two Chicago-based lawyers, and firing Guy Petrillo and Amy Lester. Reportedly, Cohen has fallen behind in payments to Petrillo and Lester. On Monday, Judge T.S. Ellis abruptly canceled sentencing for Paul Manafort in the Virginia case scheduled for February 8, citing the current dispute in D.C. court over whether Manafort broke his plea deal. On Monday, press secretary Sarah Sanders convened the first White House briefing since December 18, the first in 41 days. Both CNN and MSNBC did not cover the briefing. National security adviser John Bolton said the U.S. will impose sanctions against Venezuela’s state-owned oil company, Petróleos de Venezuela, S.A., cutting off President Nicolás Maduro’s main source of cash. At the White House briefing, Bolton held a yellow notepad with what appeared to be the words “5,000 troops to Colombia,” sparking reporters to speculate on a military intervention. 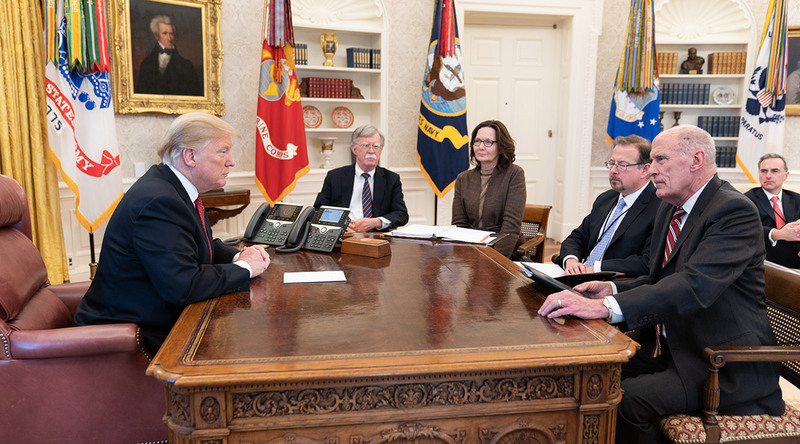 When asked by reporters to clarify Bolton’s notes, a White House spokesman reiterated Trump’s “all options are on the table” declaration. Experts noted it was highly unusual for a DOJ official to publicly comment on an ongoing investigation, and expressed concern that Whitaker might participate in the review process after the investigation concludes. On Tuesday, Sens. Richard Blumenthal and Charles Grassley of the Senate Judiciary Committee introduced a bill to ensure the Mueller report would be released directly to Congress and the public. The Senate Judiciary Committee also delayed a scheduled vote to move William Barr’s confirmation forward by one week, citing concerns based on his testimony that the Mueller report would be released. On Monday, CNN reported Mueller’s team still wants to have Stone associate Andrew Miller appear before the grand jury. Miller has been fighting a subpoena in Mueller’s Russia probe of the 2016 election. Miller’s attorney told CNN that Mueller’s team made clear to him that they and the Justice Department are considering an additional indictment of Stone and may have plans to charge others. ABC News reported that NRA emails and photos posted on social media show the organization was significantly involved in planning the trip to meet with senior Kremlin officials. In one email, a NRA employee helps Maria Butina make travel arrangements for the delegation which included the NRA president and future president, as well Trump campaign surrogate sheriff David Clarke. Dozens of pages of emails between August 2015 and November 2016 detail Butina’s efforts to organize the summit. Sen. Ron Wyden is investigating the meeting and seeking “information and documentation” from the NRA. On Tuesday, Financial Times reported that Trump and Putin spoke during last November’s G20 summit in Argentina without a U.S. official present to take notes. Only First Lady Melania Trump attended. The White House had previously disclosed that Trump met Putin for an “informal” talk, but did not disclose that Trump had no official member of his team present. Putin had a translator present, Trump did not. According to a Russian government official, the two spoke for about 15 minutes about a number of foreign policy issues. Trump had canceled formal bilateral talks due to a dispute over Ukrainian naval vessels. Trump also tweeted that Sims “signed a non-disclosure agreement. He is a mess!” Trump campaign chief operating officer Michael Glassner said it may sue Sims, claiming he violated his NDA. On Wednesday, a court filing by Mueller’s team revealed Russian troll farm Internet Research Agency, currently facing a legal battle for interference in the 2016 election, is waging a disinformation campaign against Mueller. According to the filing, Mueller’s team turned over one million pages of evidence to lawyer for for Concord Management, owned by Yevgeniy Prigozhin, known as “Putin’s chef,” as part of discovery. Concord is accused of funding IRA. Allegedly someone connected to Concord manipulated and leaked the documents to reporters to make it appear that Mueller’s case against IRA and Concord were flimsy. According to the filing, a Twitter account called @HackingRedstone tweeted: “We’ve got access to the Special Counsel Mueller’s probe database,” and sent the altered documents. The account was suspended. On Friday, an unsealed docket confirmed that it is Mueller’s team that is involved in the mysterious grand jury subpoena fight that a government-owned foreign company has taken to the Supreme Court. WAPO reported that on January 18 about a dozen long-time employees from Latin America at the Trump National Golf Club in Westchester County, New York were summoned, one by one, and fired. The employees, who compose about half the wintertime staff, claim they were fired over their undocumented status, following reporting on undocumented labor at Trump’s club in Bedminster, New Jersey. On Monday, BuzzFeed reported according to a petition posted by the Department of Labor, Eric Trump’s Virginia winery is looking to hire 23 foreign guest workers under the federal H-2 visa program. The program allows U.S. employers to hire foreign laborers on a temporary basis so long as no qualified U.S. worker wants to the job. Trump Vineyard Estates, LLC pays $12.25 per hour for the positions. A report by the Anti-Defamation League on murder and extremism in the U.S. found domestic extremists killed at least 50 people in 2018, the fourth-deadliest year on record for extremist-related killings since 1970. LA Times reported two years after Trump signed an order to hire 5,000 new Border Patrol agents and 10,000 more Immigration and Customs Enforcement officers, thousands of positions remain unfilled. The regime has spent tens of millions on hiring, yet Border Patrol has about 2,000 more vacancies than when Trump signed the order. ICE has hired 1,325 investigators and deportation officers, but lost about 1,600. On Sunday, veteran journalist Tom Brokaw said on a “Meet the Press” panel about xenophobia in the U.S. that Hispanics should “work harder at assimilation.” Brokaw later apologized in a series of tweets. On Monday, NBC News reported comedian Mohanad Elshieky, who was traveling home to Oregon after a performance, was ordered off a Greyhound bus after two Customs and Border Protection officers boarded. The officers asked if he was an American citizen, so he showed his driver’s license and valid work authorization card. They made him call for details on his asylum document. CBP called the incident a misunderstanding. On Tuesday, Jussie Smollett, a gay, Black actor, was attacked by two men who yelled racial and homophobic slurs, hit him, poured an unknown chemical substance on him, and wrapped a rope around his neck. Smollett plays a gay musician on TV, and he also self-identifies as being gay, and is an activist for LGBTQ rights and HIV education. Chicago police said they were investigating the incident as a possible hate crime. In a follow-up interview with Chicago police, Smollett said his attackers yelled “MAGA country” during the assault. He was attacked while walking downtown around 2 a.m. Right-wing internet and social media accounts put forward, without evidence or by citing false information, that Jussie’s attack was a hoax — similar to the Covington kids alternative narrative in Week 115. In an impassioned appearance on Smollett, actress Ellen Page accused Trump and Vice President Pence of fostering a climate of hate, saying “connect the dots” with the rise in crimes against marginalized people. On Thursday, when asked about the attack on Smollett, Trump said “That I can tell you is horrible. I’ve seen it. Last night. It’s horrible. Doesn’t get worse.” Trump then pivoted the discussion to the need for his wall. On Thursday, AP reported ICE has started force-feeding immigrants at a Texas location, after immigrants at several facilities have gone on hunger strikes over the past month to protest conditions inside detention facilities. At an El Paso, Texas ICE detention center, nearly 30 men, mostly from India and Cuba, have been striking to protest what they say is rampant verbal abuse and threats of deportation from guards. There are also hungers strikes at ICE facilities in Miami, Phoenix, San Diego, and San Francisco. The men in El Paso are being force-fed through nasal tubes leading to persistent nose bleeds and vomiting. On Thursday, CBS News reported ICE told hundreds of immigrants they were issued a Notice to Appear (NTA) for hearings scheduled January 31 or risk being deported. For many immigrants, the notices were fake. Immigration attorneys in Chicago, Miami, Texas, and Virginia said they learned the dates were not real when they called the courts to confirm after an advisory from the Executive Office of Immigration Review. On Wednesday, WAPO reported nearly 100,000 comments were posted with the Education Department website on Secretary Betsy DeVos’s plan to overhaul rules on campus sexual assault — 20 times what is typical. A spokesperson for the American Council on Education, which represents university presidents, said DeVos’s plan is the most controversial regulatory undertaking in the history of the Education Department. Several figures in the pro-Trump media, including Sebastian Gorka, falsely claimed online that Supreme Court Justice Ruth Bader Ginsburg is hiding a secret illness or is dead. The claims were based on a QAnon conspiracy theory. HuffPost reported Rep. Steve King’s house.gov official government website links to a white nationalist blog that contains racists, anti-Semitic, and Nazi sympathizing content. ABC News reported according to court papers filed Friday night, the Trump regime does not know how manymigrant children were separated from their parents at the southern border before the “zero-tolerance” policy. The filings, in response to the findings by the department of Health and Human Services inspector general in Week 114 and mandated by a California judge, showed the regime could not confirm or deny reports of thousands of additional family separations. The deputy director of the Office of Refugee Resettlement told the judge that identifying separated children between July 2017 and June 2018 was not feasible, and that the regime does not intend to figure it out. On Friday, photos surfaced from Virginia Gov. Ralph Northam’s 1984 medical school yearbook which showeda man in blackface and another in a Ku Klux Klan robe. Northam apologized and said he was in the photo. On Saturday, despite a flood of calls from numerous prominent Democrats and progressive organizations and activists for him to resign, Northam refused and changed his story to say he was not pictured in the photo. On Tuesday, an ABC News/Washington Post poll found 56% of all adults say they would not consider voting for Trump in 2020, while just 28% said they definitely will vote for him, and 14% said they would consider it. Among mainline Republicans, 27% want a Republican other than Trump. When including GOP leaners, 41% of women, 42% of independents, and 49% of moderates want another Republican alternative. On Tuesday, Director of National Intelligence Daniel Coats, CIA Director Gina Haspel, FBI Director Christopher Wray, and other top U.S. intelligence officials gave annual testimony before the Senate Intelligence Committee on national security challenges. The testimony highlighted the distance between intelligence officials and Trump on several critical fronts, and are detailed in an annual “Worldwide Threat Assessment” released on Tuesday. None of the officials said there is a security crisis at the U.S.-Mexico border, negating the need for a national emergency. Coats said high crime rates and a weak job market were spurring Central Americans to migrate. Officials also warned that ISIS has not been defeated as Trump asserted in his plans to withdraw U.S. troops from Syria, but rather is a still-formidable organization capable of attacking the U.S.
Haspel said Iran was in compliance with the Joint Comprehensive Plan of Action agreement, but Iranian leaders are discussing reneging on the deal if they fail to reap the economic benefits given Trump pulled the U.S. out. Trump also celebrated what he claimed were his accomplishments, saying ISIS’s control in parts of Iraq and Syria “will soon be destroyed,” and that there was a “decent chance of Denuclearization” in North Korea. Representatives from the CIA and DNI declined to comment. None of the agencies whose leaders testified have issued retractions or amendments to their written or spoken statements. On Tuesday, WAPO reported U.S. intelligence officials learned in late 2018 that Russia made a secret proposal to North Korea in the fall 2018 to build and operate a nuclear power plant there. Byproduct and waste would be transferred back to Russia, reducing the risk North Korea would use it to build nuclear weapons. The offer marked a new attempt by Moscow to intervene in the high-stakes nuclear talks. On Thursday, Trump announced he is planning to meet with Kim Jong Un for a second summit at the end of February. CNN reported sources say the location will be the Vietnamese coastal city of Da Nang. On Wednesday, a Gallup poll found Republican Party favorability dropped to 37% from 45% in September, due to the government shutdown. Favorability for Democrats stayed at 45%. Graham also asked if the FBI had tipped off the media, writing “the American public has had enough of the media circus that surrounds the Special Counsel’s investigation.” CNN has insisted they were not tipped off. On Thursday, NPR provided a fact check of whether the FBI used unusual force when arresting Stone, and found the answer to be no, the arrest was typical for law enforcement agencies. On Thursday, in a court filing, Mueller’s team described evidence seized in the FBI raid of Stone as “voluminous and complex,” and asked the judge to delay the trial to give them more time to sift through the information. On Friday, Judge Amy Berman Jackson said she is considering slapping a gag order on Stone, who has been on a media blitz since his indictment. Jackson said the trial will likely take place in July or August. On Thursday, CNN reported according to records provided to the Senate Intelligence Committee, Donald Jr.’s calls to a blocked number before and after the June 9 Trump Tower meeting were not with Trump. ABC News reported Donald Jr.’s calls on June 6 and June 9 were with two family friends: NASCAR CEO Brian France, and real estate developer Howard Lorber, who has done business in Russia. Trump’s ties to Lorber have drawn the interest of congressional investigators. In the 1990s, when Trump explored real estate options in Russia, Lorber accompanied him on a tour of Moscow. On Thursday, Democratic Reps. Ted Lieu and Don Beyer in a letter called on acting chief of staff Mick Mulvaney to revoke Jared Kushner’s security clearance, citing reporting in Week 115. On Thursday, Trump sent a series of morning tweets, alternating between demanding a wall and saying that one was already built, saying, “Large sections of WALL have already been built.” This is a false claim. Trump added, “And if it’s not going to work, then the politicians are really wasting a lot of time,” saying he could end up circumventing Congress by declaring a national emergency to fund his wall. On Thursday, in a rebuke of Trump’s foreign policy, the Senate voted 68-to-23 to advance legislation drafted by Leader Mitch McConnell strongly opposing Trump withdrawing troops from Syria and Afghanistan. The rebuke, along with the House vote to prohibit the use of funds to withdraw from NATO in Week 115,signals an increasing trend of growing dissent to Trump’s foreign policy by Congress. Congress is also questioning Trump’s moves in Venezuela, where he is following the lead of Sen. Marco Rubio. Sens. Cory Gardner and Bob Menendez plan to reintroduce the North Korea Policy Oversight Act. On Thursday, the Trump regime cut off all U.S. aid to Palestinian security forces for training and equipment, an unintended consequence of the Anti-Terrorism Clarification Act (ATCA) signed by Trump last October. ATCA was meant to make the Palestinian Authority pays compensation to terror victims who won civil suits against the PLO in U.S. courts in exchange for U.S. aid. Palestinians chose not to sign or receive aid. On Friday, Secretary of State Mike Pompeo announced the U.S. will withdraw in six-months from the 1987 Intermediate-Range Nuclear Forces Treaty, one of the last major nuclear arms control treaties with Russia. Trump did not say if the U.S. would replace the I.N.F., telling reporters “I hope we’re able to get everybody in a big, beautiful room and do a new treaty that would be much better,” without specifying who he meant. Trump’s decision, when first leaked in October, took European allies by surprise, leaving allies fearful of Trump’s unilateral instincts and their recognition that Putin poses a growing threat. On Friday, WAPO reported Leader McConnell has privately cautioned Trump about declaring a national emergency, telling him the move could trigger political blowback and divide the GOP. At least six Republican senators are fiercely opposed to the move, and polling during the shutdown found that 66% of Americans were against it as well — 12 points higher than opposition to the wall. On Thursday, NYT interviewed Trump in the Oval office for 85 minutes, after publisher A.G. Sulzberger declined an off-the-record dinner invitation from Trump and asked for an on-the-record interview. In a rambling interview, Trump insisted he forced Jim Mattis to resign, said Rudy Giuliani “has been wrong” on Trump Tower Moscow and other matters, and signaled forgiveness for Steve Bannon. On Saturday, NYT reported Trump sought a previously unreported loan from Deutsche Bank in early 2016 to get money for Trump’s Turnberry property, at a time when he was lending tens of millions to his campaign. Although Deutsche Bank had been a lender of last resort for Trump for years, they turned down the loan, fearing the reputation of the bank could be harmed because of Trump’s polarizing statements during his campaign. Bankers in the private banking unit appealed the denial to Deutsche Bank’s top executives in Frankfurt. Reportedly it was upon this review that senior officials realized the scope of lending to Trump. On Saturday, NBC News reported analysis of the main English-language news sites used by Russia in the 2016 election show Rep. Tulsi Gabbard, who is about to announce her 2020 run, is the favored Democrat. Websites and social media linked to the Kremlin noted sites associated with propaganda, including RT, the Russian-owned TV outlet; Sputnik News, a radio outlet; and blog Russia Insider are all backing Gabbard. Washington Examiner fired two reporters who were nonpartisan, straight-news reporters on Friday, while hiring new staff, signaling a possible shift in news coverage to be more conservative and Trump-friendly.